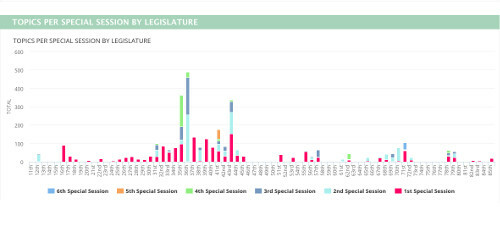 Check out the Texas Politics Projects Data Visualization archive for graphical representations of data relevant to current political conversations. The Texas Politics Project seeks to engage educators, students, political professionals, and the public on all things Texas politics. In the coming months, we will launch a new data visualization project that will provide timely, accurate, and informative graphical representations of important political information to inform current policy debates. Check back here for updates. The Texas Politics Project makes all of its polling data, collected in conjunction with the Texas Tribune, publicly available. Data from the UT/Texas Tribune Poll has appeared in Government Department faculty and graduate student research, as well as in published research in fields as diverse as public health, environmental studies, and science policy. If you've published or presented something using our data, please let us know, so that we may add you to our publications list.